A new research programme aims to understand 3D vision in the praying mantis, the only invertebrate known to have this ability, and compare it with vision in humans. Analysing how mantises see in three dimensions could give us clues about how 3D vision evolved and lead to novel approaches in implementing 3D recognition and depth perception in computer vision and robotics. The team, led by Dr Jenny Read from the Institute of Neuroscience at Newcastle University, has been funded by a £1M Research Leadership Award by the Leverhulme Trust to characterise the mechanisms of 3D vision in mantises and how these mechanisms can be applied in science and industry. See a video of the research. It is also possible that 3D vision in mantises is closer to that of vertebrates, where disparities between the positions of an object’s image in the two eyes can be detected and used to reveal the object’s position, even when the object is camouflaged and thus invisible in either eye individually. This would mean that mantises have independently evolved similar 3D processing to vertebrates – a fascinating insight into the evolution of 3D vision. A key component of the research entails presenting virtual 3D stimuli, such as moving targets within the visual field of the mantis. 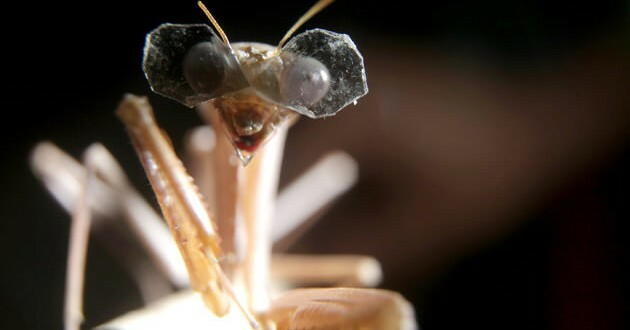 As a first approach, the researchers are attaching a pair of 3D glasses – the world’s tiniest – with beeswax to the mantis, and placing it in front of computer-generated images, presented on computer monitors. After the experiments, the scientists remove the beeswax and the glasses, and place the mantises back in the insect room where they are fed and maintained. The experiment will determine if mantids can see the moving object standing out in depth in a similar way to humans and monkeys. The research project will use data from behavioural observations as well as electrophysiological recordings to help model potential neural algorithms that can be used in technology while simultaneously shedding light on the evolution of 3D vision in the natural world. This is the first major research project investigating these mechanisms following the discovery made by Samuel Rossel in 1983 that praying mantises have 3D vision. Rossel conducted successful experiments by placing prisms over their eyes and creating an optical illusion that an object was within their range, thus triggering a strike from the mantises.